Located in Lien Chieu District, Da Nang City, Nam O has long been famous for its fish sauce. Founded in the early 20th century, the village is now facing a lack of land on which to build workshops. VOV’s correspondent in the central region reports on how villagers are preserving their traditional craft. Nam O fish sauce is made from long-jawed anchovies with a high protein content. To create the sauce’s delicious taste, the fish must be freshly caught and of medium size. The taste depends on the right mixture of fish and salt. The fish is interlayered with salt in vats for one year. 200 to 300 kilos of fish salted in one vat turns out 100 to 150 liters of fish sauce. The production area is shrinking, threatening the traditional craft. In 2016 an ecotourism project called Lancaster Nam O Resort was begun in the village, forcing many local households to move. 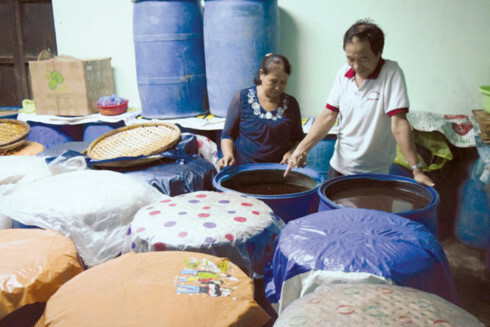 The number of households producing fish sauce has been halved to just 55. Da Nang authorities have asked the Trung Thủy Joint Stock Company of Da Nang, the project’s investor, to adjust its planning and finance the village’s recovery of its fish sauce production. Despite social changes, Nam O village continues its craft. Several local producers have enlarged their workshops. The municipal Department of Industry and Trade and the Center for Agricultural Expansion Encouragement have helped locals register trademarks, obtain machinery, find outlets, and promote and advertise their products. Dam Quang Hung, Chairman of the Lien Chieu district People’s Committee, said “We have directed the authorities of Hoa Hiep Nam ward, a major fish sauce production area in Nam O, to review and collect opinions of the families currently living in the village as well as those who have already been relocated plus cooperatives’ statistics. Then we will advise the Da Nang administration on choosing a production site that will ensure no environmental pollution. Nam O fish sauce is available in Da Nang and as far away as Hanoi, Dak Lak, and Ho Chi Minh City.